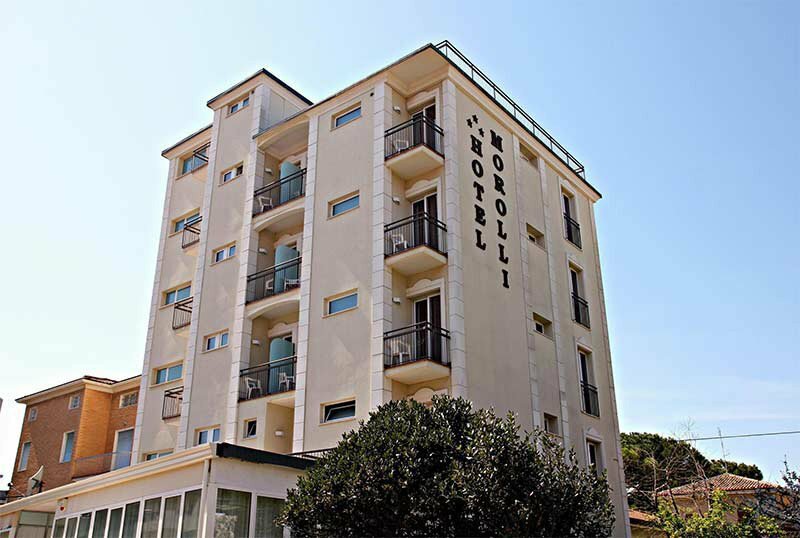 The Hotel Morolli B & B is a completely renovated three-star hotel in Viserba di Rimini. It is ideal both for beach holidays and for business trips as it is located close to the beach and a few kilometers from the Fiera di Rimini. It offers outdoor parking, WI-FI throughout the entire hotel and disabled facilities. Accepts small pets. The hotel is located in Viserba, a district north of Rimini, in a quiet position at the end of a small closed road, away from traffic noise and a short distance from the beach. A few kilometers from Viserba is the new Rimini exhibition center and the Italia in Miniatura theme park. The rooms are comfortable, with hypoallergenic parquet floors and comfortable sommier and anatomic and ergonomic mattresses. All have private bathroom with shower and hairdryer, telephone, safe, LCD satellite TV, WI-FI connection, independent air conditioning and heating. Most of the rooms have French balconies and many have balconies and sea views. Some rooms of superior category are available, with a minimum width of 15 square meters, a 170-cm sommier and well-kept decor, equipped with a sofa, minibar, 32 "LCD TV and extra little attention Breakfast in the room on request. Open-air porch, sun terrace with shower, reading room and TV sat room with bar, welcome drink. Throughout the structure, piped music in the common areas, entertainment in the hotel and on the beach, excursions, tournaments, spaghetti. PARKING: fenced, uncovered and free, available until places are exhausted. CONVENTIONS: beach, amusement parks, discos, INAIL / INPS, law enforcement agencies. On request: shuttle service and organized excursions. SERVICES FOR DISABLED: entrance with inclined ramp, lift for disabled people, rooms with adequate wheelchair maneuvering space, accessible shower and with chair. BREAKFAST: international buffet breakfast with convenient hours and choice between sweet and savory dishes, freshly baked croissants and homemade pies prepared by the chef. LUNCH AND DINNER: the hotel offers guests agreements with some restaurants in the area and organizes food and wine tours. In the hotel: strollers. Pediatrician and baby sitter on request. The hotel has an agreement with the beach n. 22, with playground and live entertainment. TOURIST TAX: excluded, € 2.00 per person per day for up to 7 days, children under 14 are exempt. - To confirm the reservation, you must specify the exact dates of arrival and departure, and send a deposit of € 300.00.